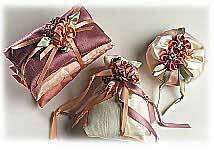 These lovely sachets make a sweetly scented gift for bridesmaids. Don’t forget the bride herself and tuck them into her suitcase packed for the honeymoon. Choose your own color scheme and favorite fragrance. Or give one to anyone special – they’re wonderful to lightly scent a lingerie drawer. 1. Place two fabric pieces on top of each other, right sides together. Machine stitch the two long sides and the bottom end together. Turn right side out. 2. Turn top end inside the bag about 2”. 3. Place a small amount of stuffing in bottom of bag. Fill with potpourri and place additional stuffing on top. Close bag tightly and tie securely with small piece of ribbon. 1. Cut ribbons into 30” lengths. 2. Make a loose overhand knot 1-1/2” from end of each ribbon. 3. Make overhand knot 3” from first knot. Continue making knots 3” apart on each ribbon piece. 4. Stack four ribbons together. Using heavy thread, stitch through ribbon between second and third knots on all four ribbons. 5. Take a small stitch between each successive pair of knots leaving the last two knots hanging free. 6. Pull thread to gather knotted ribbons. Secure end of thread. 7. Attach ribbon pompom to front of bag with a few small stitches. Trim ribbon ends at an angle. 1. Cut each fabric rectangle in half so you have six pieces measuring 7” x 4”. 2. Stitch each pair of rectangles, right sides together, leaving a small opening for turning. 3. For each bag, turn right side out, fill with a small amount of stuffing and potpourri, and whipstitch opening closed. 4. Stack three bags together and tie with 1/4”-wide peach ribbon. 1. Cut 5/8”-wide mauve ribbon 20” long. With thread, run gathering stitch along one edge of ribbon. 2. Pull thread to gather ribbon, stitch ends of ribbon together, and secure thread. 3. Cut two 9” lengths of 1/4”-wide mauve ribbon. Run gathering stitch along one edge of ribbon. Pull to gather and secure threads. Make two flowers. 4. To make leaves, cut green ribbon into three pieces 2-1/2” long. At the midpoint of each piece, fold one side of ribbon to the front at a 60-degree angle; then fold the other side to match. Stitch across both ribbon ends 1/4” below selvage. Draw up stitching and knot the thread. 5. Arrange finished flowers and leaves on top of stack. When satisfied with arrangement, stitch each in place. 1. Place two fabric circles right sides together. Machine stitch around raw edges, leaving an opening for turning and stuffing. 2. Turn right side out; lightly fill with stuffing and potpourri. 3. Hand stitch opening closed. 1. Cut two 9” lengths of ivory ribbon. Run gathering stitch along one edge of each piece. Lightly gather to create an approximate half-circle. Tack one on each side of sachet. 2. Cut two 9” lengths of mauve ribbon. Run gathering stitch along one side of ribbon, adding a stitch at opposite edge of ribbon every six stitches to make petals on flowers. Continue around flower until you have five petals. Secure thread. 3. With small piece of green ribbon, tie loose knots on top of each other, and glue or stitch to the center of mauve flowers. 4. For small peach flower, gather ribbon piece on one edge of ribbon and secure. 5. With remaining green ribbon, tie double loop bow, with two streamers. Tie knot in each streamer. Tuck bow under flowers and tack or glue. Add a single loop of green ribbon at top, tucked behind the flowers.